Fifty years ago an M.I.T. computer whiz kid named Peter Samson and a group of his schoolmates attempted one of the most audacious stunts in the history of the New York City subway system. Samson programmed M.I.T.’s PDP-6 mainframe computer — about the size of a passenger elevator — to calculate the most efficient route to ride the entire subway system in the least amount of time. In their outrageous attempt to break the existing riding record the team employed payphones, runners, and a teletype hook-up between a makeshift “data center” in midtown Manhattan and the mainframe in Cambridge, Mass. 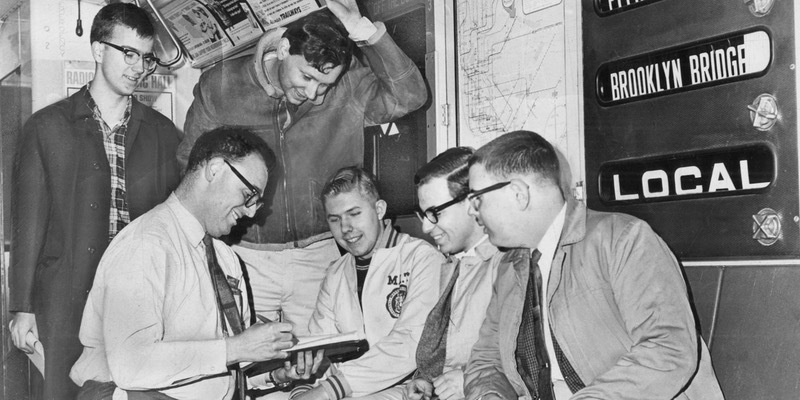 Michael Miscione, the Manhattan Borough Historian, will interview Samson and one of his schoolmates, George Mitchell, as they recount the Great Subway Race of 1967. Come and find out how it all played out. Watch a 5-minute video preview. Samson’s subway racing experience, by the way, was a mere colorful blip in a much more substantive career. At M.I.T. he and his friends were the high priests of the school’s still-new computer lab – the original “hackers,” a term that originated in the lab. Their vision of computers as more than just business calculators laid the foundation for today’s personal computer and video game era. They were the pioneers who would later move out west to inspire and teach the Bill Gateses, Steve Wozniaks, and Steve Jobses! Do people today still try to break the subway riding record? Sure — it makes the news every year or two. But now they carry their route-planning computers in their pocket. RSVP at the event page.